This is a meet. This is a cruise-in. This is just a good time hanging out and talking with your friends and fellow enthusiasts while perusing the cars that have come out. 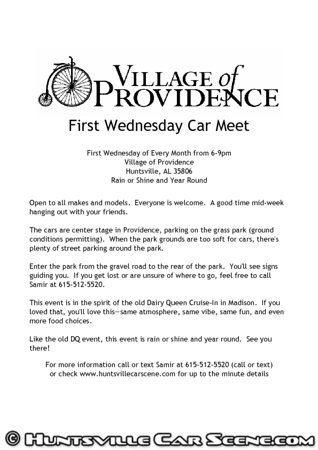 If you remember the old Dairy Queen Meet/Cruise-in in Madison from years past, this event is a reboot of that. It is a family-friendly environment with plenty to eat so bring your kids. This event is for every enthusiast in the area, young or old, for any enthusiast vehicle new or old, fast or slow, on road or off, 2-wheeled or 4. There is no registration fee, no door prizes or anything like that. Just a good time with fellow enthusiasts. 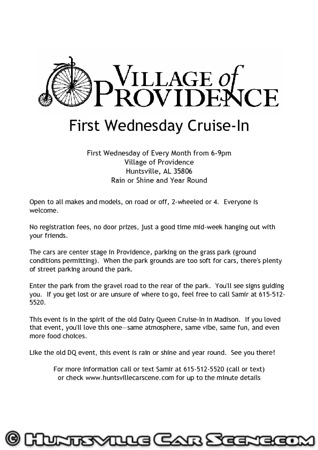 This event is in the spirit of the old Dairy Queen Cruise-In in Madison. If you loved that event, you'll love this one—same atmosphere, same vibe, same fun, and even more food choices. Please enter from the front on the ramp over the sidewalk in front of The Brickhouse AFTER 5 PM (please allow the staff time to set up for the event). We will have some signs posted and cones placed to help aid with parking. 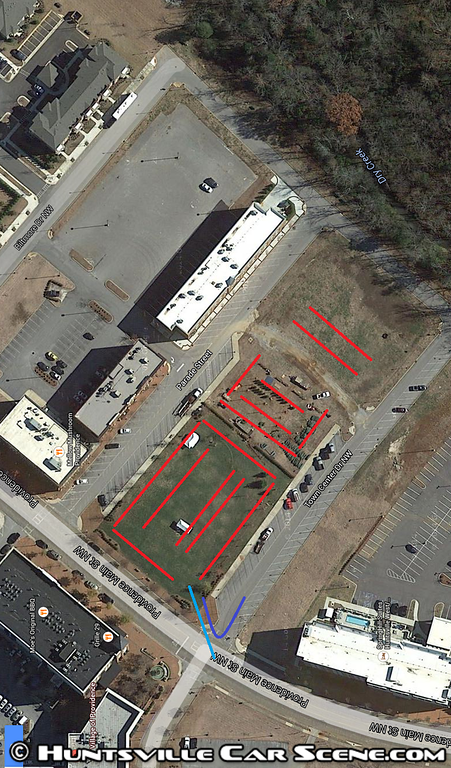 Once the front lawn is full we will start parking on the rear lot. If that area fills up please find a parking spot around the grass. The goal of this meet is to provide a fun family friendly environment. ALL CARS ARE WELCOME and parking will be FIRST COME FIRST SERVE however we do reserve the right to save a few spots for select cars. Thanks again for everyones continued support and thanks a ton to everyone that helps make this event a success. Like the old DQ event, this event is rain or shine and year round. See you there! This event is held in conjunction with the Village of Providence, who graciously permits enthusiast vehicles to park on their grassy park at the center of Providence, surface permitting. When the ground may not be able to support the weight of vehicles, the parking spots adjacent to the park will be used. 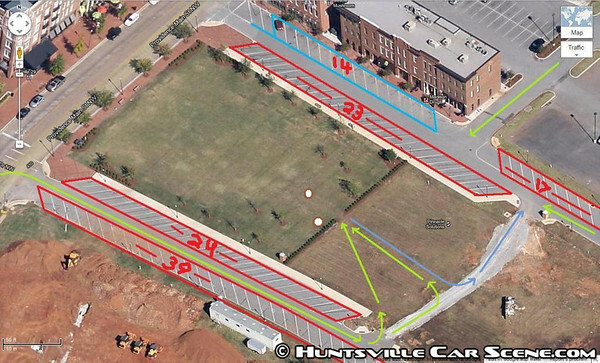 Parking notifications will be posted here on Huntsville Car Scene.com. This event is rain or shine and year round, just like DQ used to be. The entrance for the grass field is behind the grass field. There is a small gravel road leading from the pavement. Follow the signs with arrows at the stop sign at Brickhouse. And if you're unsure, feel free to ask someone or contact me directly at 615-512-5520. I may not be able to answer calls immediately the day of the event due to volume, so feel free to call me in advance and I'll explain exactly where to go. And if you want a meal for free, just stop by at Huntsville Car Scene supporter Liberty Mutual Insurance in Providence for a free quote on your auto and home insurance, and they'll send you a gift card for dinner at your restaurant of choice in Providence. Just have your proof of insurance and ID. Come out and enjoy the sights, sounds, and smells of Providence in your favorite ride. See you all there!